Military interest in vision, and military skepticism of the reliance on vision, have many dimensions. Here we consider just two aspects of vision in the military: how human vision is enhanced with the help of machines, and attempts to combine various data sources into integrated battlefield visualizations. The chapter concludes with a review of attempts made outside the military to address the military’s uses of visual media. Although it has been tempting to say, like Harun Farocki, that some contemporary digital images are “operative,” that is, they “do not represent an object, but rather are part of an operation,” the examples Farocki provides, including videos used in missiles, are in fact always centrally concerned with the representation of objects. When a missile speeds to its target, the image is “operative” in the sense that it provides part of the information that guides the missile, and in that the image itself participates in the destruction of what it represents: but adequate, verifiable or deniable representation of objects is a crucial condition for the operation itself. Representation remains separable from operation; this is apparent, for example, in warfare’s increasing reliance on surrogates for human vision. Most remote sensing armaments, including missiles and drones, rely on video technology to provide images from the armament’s point of view. An intermediate between direct combat and wireless control is the wire-guided missile, which unspools fiber optic cable thinner than fishing line as it flies. The operator guides the missile to its target by watching video feed from a camera in the nose of the missile. Wired connections are more reliable than Wi-Fi in some battlefield situations because they are harder to jam. The enhanced fibre-optic guided missile (EFOGM) manufactured by Raytheon Electronic Systems in Bedford, Massachusetts in the 1990s, launched vertically, paying out cable as it went. It was turned, in flight, either manually or via several programmed waypoints, so that its flight path was not “ballistic” and the operator could be safely hidden. An EU missile of this kind, the Polyphem (canceled in 2003), had a range of 60 km, and in its entire flight the missile remained tethered to its operator. The physical separation between an act and its consequences is clearly heightened in remote… operations, but it is also dispersed across the network as senior officers, military lawyers, image analysts, and ground commanders all scrutinize the video feeds from the Predators and Reapers. In addition drone video is silent, creating an “intrinsically visual economy” that contributes to the depersonalization of the killing. As the Amnesty International report “Will I Be Next? 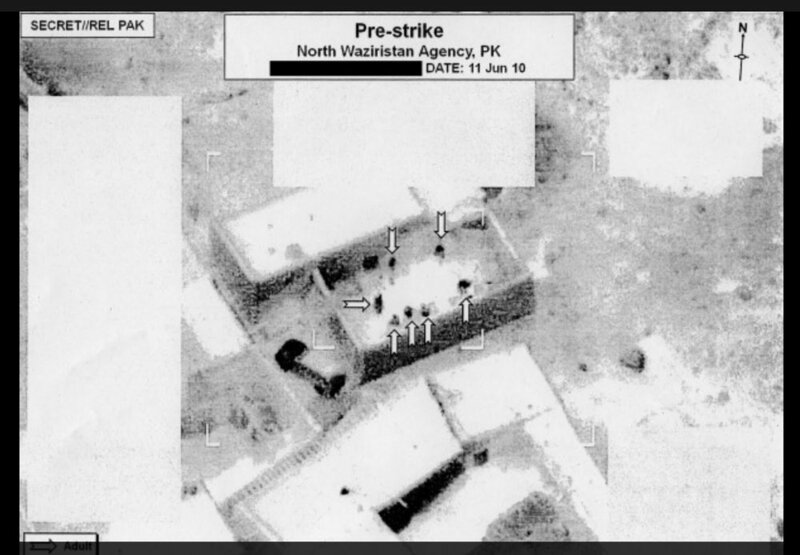 US Drone Strikes in Pakistan” (October 22, 2013) notes, the US government remains secretive about almost every aspect of the drone program. Hence it is not surprising that it is nearly impossible to find any images taken by drone cameras. Fig. 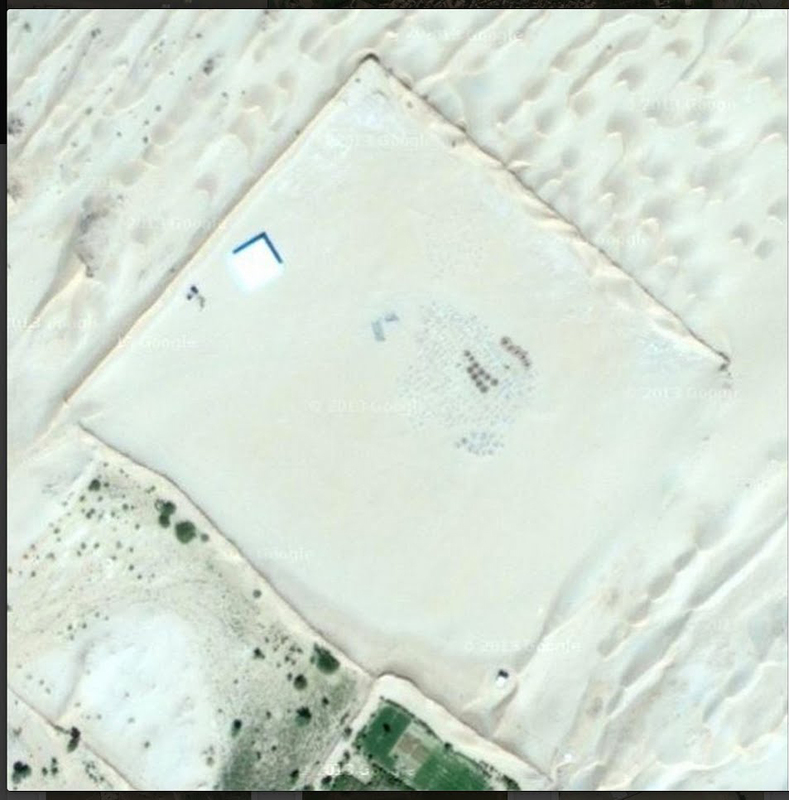 1 is from a set of surveillance images obtained by the Washington Post; the images were taken before and after drone strikes, and are presumably similar to actual drone images. The military is also actively involved in reducing the domain of what we have called the undepictable. Since World War II a number of new photographic and video technologies have been developed for military applications, beginning with Harold Edgerton’s rapatronic cameras, which were used to photograph the first millionths of a second after the detonation of atomic bombs. 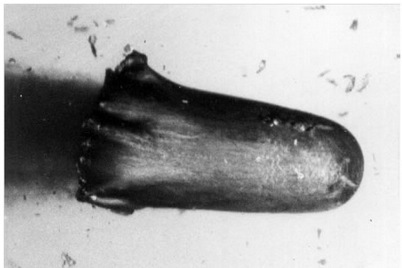 High-speed cameras known as streak cameras, for example, have been used to visualize explosively formed projectiles, which are essentially metal shapes that reform themselves in the air, turning into slugs that can penetrate tank armor (Fig. 2). These and other technologies are part of the ongoing expansion of the visual world that is driven by military interests. In order to track missiles, it is necessary to find a way to cut through atmospheric haze and distortion. Thermal imaging telescopes can follow the plumes of missiles, but they do not see the missile body or fragments (for example, stages or debris) because they have lower temperatures. An optimal solution is shortwave infrared (SWIR) cameras, which are sensitive to wavelengths from 0.9 to 1.7µ and can cut through atmospheric haze, providing images of lower-temperature objects such as debris. Sensors Unlimited Inc. is one of the companies that manufacture SWIR cameras for military applications. In Fig. 3, left, hot debris can be seen coming off the plume of the missile; on the right, flying debris is detected even in a distant target. SWIR cameras have another military application. On the battlefield, lasers are commonly used for targeting and as rangefinders; many modern munitions depend on laser targeting. A laser operating at an invisible wavelength is a special threat, because the target may not even realize it is being seen. Most wavelengths of lasers can be seen with night vision equipment, but lasers at 1550 nm are invisible to night vision. SWIR cameras can detect those lasers. 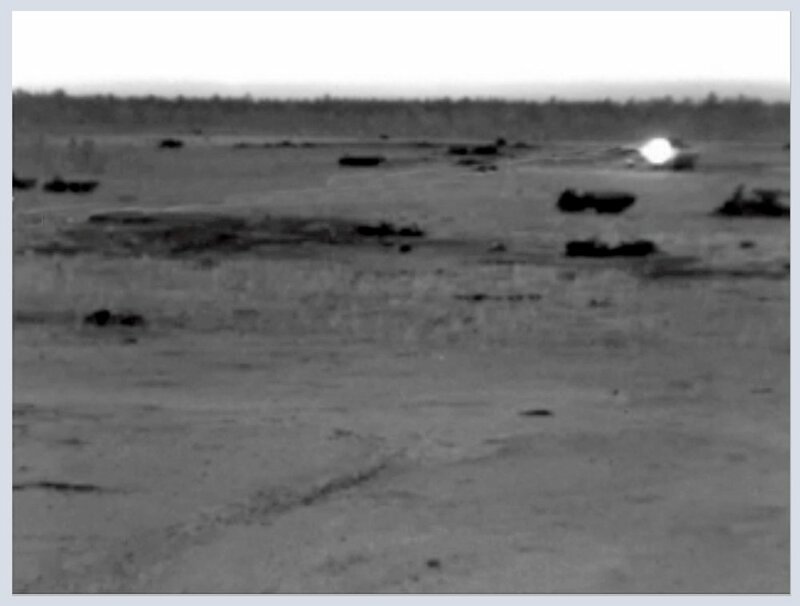 In this photograph, a SWIR camera detects a 1064 nm laser on a tank. Companies such as Defense Vision Systems manufacture 1550 nm headlights for military vehicles, and fit them with stereo SWIR cameras that are “edge matched” to provide the driver with a real-time, distortion-free stereo 120° view. The combatants’ views are clear and detailed: current generation night-vision equipment is highly processed, and the experience of looking at the world with SWIR “spectacles” is like viewing a monochrome, 3D video game. The rapatronic camera, streak camera, and SWIR camera, are examples of attempts to picture what was previously thought unrepresentable, bringing extremes of temporality and radiation into the arena of the image. These technological expansions of the visible should not be detached from the social expansions and the dispersal of the single viewing subject, as analyzed by Gregory, Farocki, and others. As in medicine and various fields of science, there have been attempts to combine different modes and technologies of information into integrated video streams, referred to as battlefield visualizations. Some critics in these discussions insist on the fundamentally informational nature of the contemporary battlefield. It has been argued, for example, that models from chaos theory are optimal to describe the complexity of the contemporary battle. But it appears that battlefield visualizations require different kinds of information, making them an instructive example of our problematic of thickets of representation. One of the approaches that blends different information sources and acknowledges the non-visual nature of some feeds is the data wall or information wall, developed by the U.S. Navy at the Space and Naval Warfare Systems Command (SPAWAR) Center in San Diego. The data wall is a multi-screen display, including maps and spreadsheets. Among its purposes is to format information “consistently” across different monitors, and to provide “a flexible configuration that can easily be changed by users.” At North Carolina A&T State University, the U.S. Army Center of Battlefield Excellence in Human-Centric Command and Control Decision Making has developed a “sense-making visualization tool” with “situation understanding capability and knowledge discovery components,” to facilitate collaborative decision making. A paper by Celestine Ntuen and Kim Gwang-Myung shows the difficulty of achieving clarity given the high number of kinds of information that come to the control center. One of their Powerpoint slides shows how many kinds of visual material go into the process of “sensemaking”; other slides show the daunting complexity and hierarchies of the contemporary battlefield operations that need to receive command decisions. In this slide, the visual material on the upper right includes “Psychological Profiles” along with blueprints, hydrographic surveys, and maps, and below them are listed such things as an “Association Matrix” and a “Link Matrix” (although it is not clear what the distinction is), a “Link Diagram,” a “Pattern Analysis Plot Chart,” and even a “Perception Assessment Matrix.” All these “Display and Visualization Components” map into the flow chart to the left, and end, hopefully, in “Sensemaking Processing Stages,” which are the subjects of another Powerpoint slide. Many kinds of information can be combined in data walls and other battlefield visualizations. Traditional 2D and 3D maps are usually included. Intelligence data, for example, can take the form of network graphs showing connections between events. IntelCenter in Alexandria, Virginia, for example, has developed an interactive chart for mapping al Qaeda iterations. There are also interfaces for detecting information attacks, which combine geographic with informational data, such as the U.S. Air Force’s Information Assurance: Automated Intrusion Detection Environment (IA:AIDE) system. 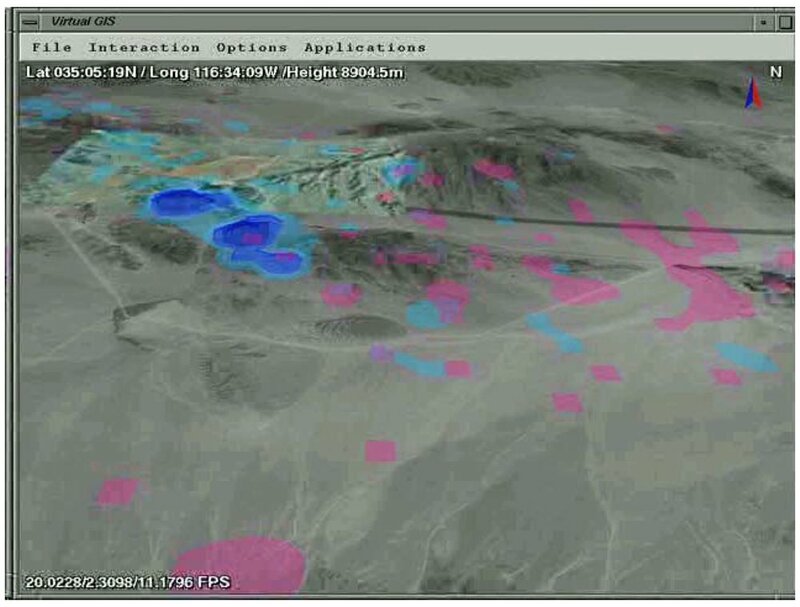 In 1996 the Sage Visualization Group at Carnegie Mellon University in Pittsburgh developed Visage, the Joint Logistics Advanced Capability Technology Demonstrator (JL ACTD), which enabled operators to effectively drag sets of data from tables to charts to maps, watching them rearrange themselves in each new context. This technology, however, has yet to reach desktop computing. In each of these cases, data are discrete points or vectors. With increasing computational power 2D and 3D maps have become more sophisticated, incorporating “flow animations to represent force movements and degrees of uncertainty,” and “animated blobs” showing groups of entities “based on behaviour and status,” including their tendencies to “aggregation and temporal compression.” This kind of computational probability map, called blobology, has been used, for example, at the Virtual GIS at the Army Research Laboratory in Adelphi, Maryland. This kind of map looks superficially similar to the heat maps used in cognitive psychology and advertising, but these “blobs” are not simple statistical aggregates or averages; they are programmed according to a range of properties. In this way battlefield visualizations combine mathematical models with different sources of images and information. There are many other examples of combined battlefield visualizations, and the discussion of the merits of the visual versus the tabular and graphic is ongoing. In addition to the underlying choice between visual and informational or graphic criteria, there is also a difference between attempts to maximize information within visual displays, and disperse information among visual and non-visual displays. As in the case of expanded human vision, machine vision, and combined visualizations, developments in the military are significantly more complex than theorizations in the arts and humanities. One of the principal interests of scholars has been finding ways to look back at military images: to see through their pre-interpreted, pre-packaged appearances, to control their dissemination, to produce interpretations of what they show that differs from the military or governmental interpretations; and ultimately, to produce images independently of the military. Nicholas Mirzoeff has been outspoken in asserting the “right to look” back at what he calls “weaponized images” deployed by the military-industrial complex. One of only a very few attempts to create imagery using military kinds of technology, targeting objects of military interest, is John Pike’s project Public Eye. Until he stopped operations in 2006, he used his platform to raise money to buy time on commercial satellites, which he targeted to sensitive sites around the world, especially those that had not often been shown to the public. His archive documents places like Yongbyon, one of the North Korean reactor sites; Phuket, site of a tsunami in 2004; Dimona, Israel’s nuclear facility; and an atomic refinement facility near Hyderabad. In all, there are dozens of such files on the website. He reports that it was often quite difficult to find accurate coordinates to send to the satellite companies. India acknowledged a facility near Hyderabad, for example, but it was difficult to pinpoint its exact location. Once the fees had been covered, and the exact coordinates had been sent to the satellite company, there was often a long wait while the satellite orbited and the company scheduled it for more lucrative jobs. After Pike obtained the photographs, he asked experts to help interpret them. They would look as closely as possible at all the details of a given site, trying to interpret every building, each pile of displaced earth, each road and gate and fence. In the case of Dimona he compared his satellite images (on the right) with pre-existing imagery from 1971. Here his satellite imagery would have been sharper, but Pike had to conform to the pro-Israeli Kyl-Bingaman Amendment to the National Defense Authorization Act of 1997, which required him to limit his resolution to the highest commercially available resolution—in this case two meters. On the other hand, he had the use of Mordechai Vanunu’s photographs, which had originally revealed Dimona to the world; Pike correlated, or “ground-truthed,” his satellite imagery by comparing them to Vanunu’s images. Unfortunately, even with all this information, Pike’s conclusions tend to be modest. At one point he notes, “the size of these buildings suggests, but cannot prove, that Israeli uranium enrichment facilities remain at a relatively small scale.” Other conclusions are similarly tentative. “North Korea’s long range ballistic missile program evidently rests on a surprisingly modest infrastructure,” he notes in the “Lessons Learned” section on Pyongyang. This is presumably the ordinary result of surveillance: partial intelligence, probabilities, guesses, modest conclusions. It is ironic that they are the result of Pike’s temporary control of the apparatus of military intelligence. A number of artists have attempted to produce visual counter-narratives to military imagery. Since 2006, James Bridle has run several websites to collect satellite imagery of places that US drones have struck (instagram.com/dronestagram). The locations are approximate—sometimes they are educated guesses—and the resolution is limited to Google images, so Bridle’s photographs may be said to be testimony about unrepresentable events rather than evidence of them. I ultimately like the project—not because I think they’re particularly revelatory or evidentiary but because they help to create a visual vocabulary with which to think about politics and space. Photo interpretation is one of those murky arts (as we've seen most strikingly with the infamous Colin Powell UN presentation [in 2003]) but having those images somehow helps to put the things they purportedly depict into our cultural/political consciousness. In my own work I am wholly unconcerned with any evidentiary role of the images—they are really meant to be art images. A successful image for me (in my own work) is one that makes a statement and simultaneously undermines any possibility of a traditional truth claim based on that image. It’s a sense of seeing/not seeing that I’m trying to capture. There is also a performative gesture I’m interested in—what are the politics of photographing some of these things, even though the photographs themselves don’t show anything? This is an eloquent statement of a fine art position in relation to documentary photography of political subjects: Paglen does not hope people will use his photographs as evidence, as Pike does. He is interested partly in testimony, as Bridle is, and partly in how images can simultaneously make statements and undermine them. It matters that the taking of such pictures can itself be a politics, even though the pictures themselves “don’t show anything.” The first claim is that a photograph can appear to tell, and yet not tell: it can have an appearance of telling, a feeling of telling. The second claim is that there is a political force in not showing in conjunction with ambiguously telling and not telling. This position is also characteristic of many declassified military images, which are redacted, decontextualized, and manipulated so that they can appear to tell without telling, to testify without giving evidence, and to show without revealing. The battlefield visualizations mentioned in this chapter are parts of a longer history of attempts to picture battles. Stephen Sanchagrin proposes three periods of battlefield visualization in his dissertation, “A View Through the Periscope: Advanced Geospatial Visualization of Naval Battlefields” (2013). The “prehistoric and ancient” period pictured battles by cave paintings and by narratives; the Renaissance saw the first “analytical representations” including battlefield maps and plans; and the modern period saw “advanced battlefield visualization.” Naval battles present special problems, Sanchagrin argues, because they involve large distances and events in 3D. Ordinary maps end up looking empty, with small dots and dashes. Sanchagrin takes as his example the Battle of the Atlantic, in which allied vessels defended shipping against U-boat attacks in 1942. These scale problems are still within the period of “analytical representations,” but he finds it necessary to produce a dozen kinds of maps, including this “cumulative battlefield surface” overlaid with isocontours to indicate the probability of battlefield events. Because no single depictive strategy is sufficient, Sanchagrin’s third period, “advanced battlefield visualization,” could also be called the period of the thickets of representation.